North Branch Park and Nature Preserve would be located two miles north of the Main Branch, in balance with Ping Tom Park located two miles south of the Main Branch. 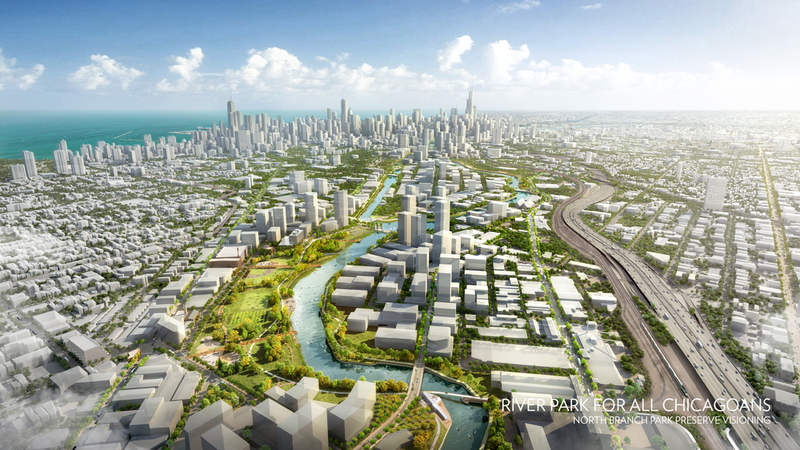 It would serve as an important component of a Chicago River Park Network that better connects neighborhoods, enhances the environment, and elevates the quality-of-life for current and future generations. The North Branch Park and Nature Preserve could feature river edge treatments to improve river ecology and welcome human engagement. Natural areas could provide important habitat for birds and other animals, while also mitigating urban heat island impacts, managing stormwater, and cleansing the air. 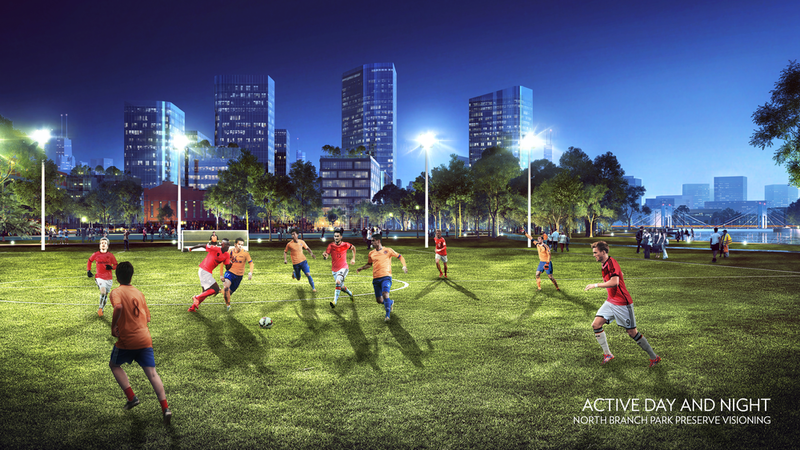 The park could contain both active and passive recreational features with separated bike and pedestrian trails that connect to transit, “The 606,” the Lakefront, Goose Island and neighborhoods in every direction. Investment is this park preserve is intended to promote citywide health and wellness, environmental conservation, and social justice. Health and wellness improvements would increase opportunities for people to be physically active in both individual activities and team sports. Environmentally-sensitive design, educational features, and programming would foster stewardship for land, water, plants, and animals. Social justice would be addressed by providing a large park very close to the underserved Wicker Park and Logan Square areas and ensuring equivalent access as a welcoming publicly-owned place for all Chicagoans. A 24-acre site along the east bank of the Chicago River between North Avenue and Cortland Street is the proposed location for the North Branch Park and Nature Preserve. The park would extend northeast to Marcey Street. The location of this park aligns with city policy recognizing that the east side of the river will transition to pedestrian-oriented mixed use more quickly than the west side of the river where higher concentrations of critical service providers and industrial businesses remain. Primary property owners include General Iron Industries, Peoples Energy, Commonwealth Edison and C. H. Robinson. C. H. Robinson will be relocating to Dominick Street into a new building by Sterling Bay who holds a real estate purchase option on the existing Marcey Street facility. Remediation of contaminated industrial land for park use is one of the most cost effective and environmentally beneficial means of addressing brownfield sites. Sketch plans are provided as “test fits” to demonstrate the scale and feasibility of a variety of park features that can be balanced to accommodate environmental, recreational & seasonal programming. With the river itself providing a natural buffer from development to the west, sunlight will shine in the park from 10:00 am to sunset every day. It is important to note that the actual design of the park and preserve would be determined through a public planning process. These illustrative plans simply convey ideas of what is possible. The North Branch Park Preserve would fill an existing five mile gap in Chicago's public riverfront park network between downtown and Belmont Avenue. The development of publicly-owned parkland along the Chicago River is a citywide issue – not just a ward or neighborhood issue. Chicago has a world-class lakefront park system and rich heritage of building large-scale public parks around which dense urban neighborhoods flourish – i.e. Washington Park, Jackson Park, Humboldt Park, Garfield Park, Douglas Park, etc. What it does not have is a 21st Century vision for an interconnected Riverfront Park Network of world acclaim given the industrial heritage of its waterways. Redevelopment of the North Branch Corridor presents one of the greatest opportunities in the City’s history to deliver intergenerational benefits of public river access and environmental stewardship. The development of a large scale, publicly-owned riverfront park and nature preserve two miles north of the Main Branch, in balance with Ping Tom Park located two miles south of the Main Branch, must not be denied. Copyright©North Branch Park & Nature Preserve. All Rights Reserved.